Miller Boat Line announced today that construction had begun for a new ferry that will expand their service line between Catawba, Put-inBay, South Bass, and Middle Bass Islands. The boat will be christened next year with the name Mary Ann Market in honor of the family matriarch. 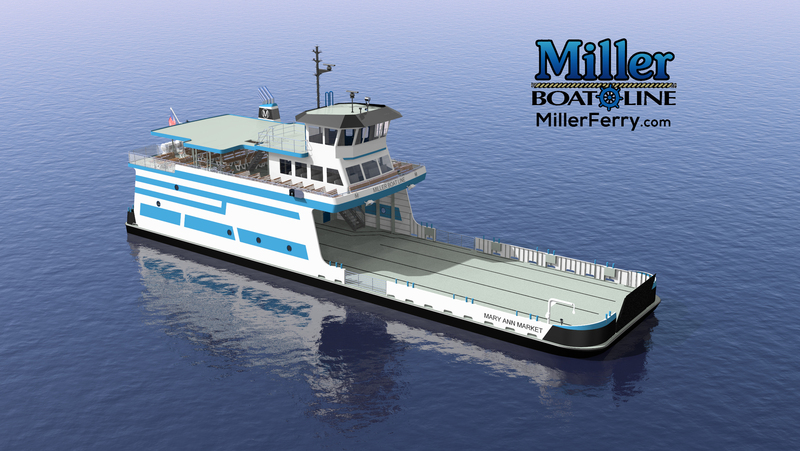 The new 140 foot long, 38.5-foot wide ferry will accommodate 26 standard sized vehicles or 600 passengers and will join Miller’s present fleet of four passenger/vehicle ferries. Miller Ferries operate between the peninsula of Catawba to Put-in-Bay (South Bass Island) and also to Middle Bass Island, Ohio; two of Ohio’s popular Lake Erie resort islands. The M/V (Motor Vessel) Mary Ann Market will feature enhanced propulsion and maneuverability, the main deck will be ADA accessible passenger cabin and restroom, and a 20% increase in cargo capacity over Miller’s largest vessel.